Punishing Assad: The idea of using war to punish wrongdoing by states has a controversial history. 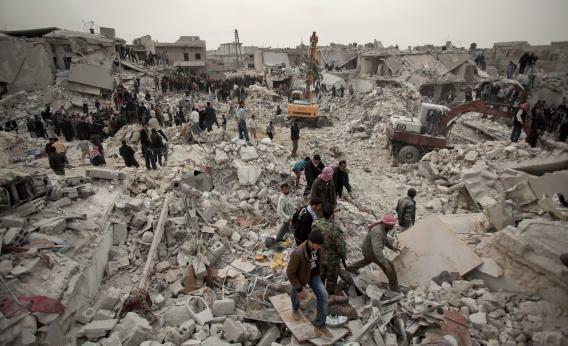 Syrians search for survivors and bodies amid the rubble of buildings in the Tariq al-Bab district of the northern city of Aleppo on Feb. 23, 2013. People like this may bear the brunt of the United States’ “punishment” of Bashar al-Assad. It seems to be taken for granted that if the U.S. and its allies begin launching missiles at Syria in the next few days, it will not be motivated less by any strategic objective than to punish Bashar al-Assad for a violation of international law and common decency and to deter him from doing it again. Obviously, there are few people on the planet as deserving of punishment right now, but the notion of using military force to accomplish this goal still seems to be going curiously unexamined. Even if there’s an element of moral outrage in most wars, punishment for wrongdoing is not generally considered a legal basis for the use of military force. This notion was once common among philosophers and theologians and not limited to Catholics. Take Martin Luther, who asked, “What else is war but the punishment of wrong and evil”. Grotius, one of the earliest international law theorists, accepted that “wars are usually begun for the purpose of exacting punishment,” though he didn’t exactly approve of it. Things changed with the rise of the nation-state and the concept of state sovereignty. “War of punishment between states is inconceivable, since there can be no relationship of superior to inferior among them,” wrote Kant. Twentieth-century international law, as expressed by the U.N. Charter, permits military force for the purposes of “individual or collective self-defense.” Obviously countries frequently stretch this norm or outright ignore it. Bush wasn’t alone. Other studies have argued that public support for both wars against Saddam Hussein’s Iraq were tied to a “moral-punitiveness effect”—the simple desire to punish a bad guy. Obviously these wars were publicly justified on national-security grounds, though one could argue that the Bush administration’s frequent invocations of 9/11 in the lead-up to the Iraq War were aimed at tapping into the public’s desire for retribution. Luban notes that modern notions of human rights and the legitimacy of humanitarian intervention add another wrinkle to this question. Interventions may be technically justified by the “responsibility to protect” and the prevention of further wrongdoing, but do the degree that the public in the intervening country supports them, the desire to punish those committing atrocities also comes into play. The article also makes a distinction between punishment and reprisal, which is defined as “otherwise-wrongful military attacks to enforce compliance with the rules of war when the adversary violates them” and is considered acceptable under international law in narrowly defined circumstances. We haven’t yet heard the administration’s full case for intervention, but it will probably focus more on the deterrence of future chemical attacks rather than response to those that have already taken place. Obama probably won’t use the word “punishment” when he presents the case for war to the American public, but given that no demands have been made of Assad—no one is suggesting that if he surrenders his chemical weapons or comes to the negotiating table in the next few days, the whole thing will be called off—this certainly does feel like punishment for a blatant human rights abuse and for crossing the “red line” Obama specified last year. Whether you agree with Luban’s take or not, that’s a more radical notion than I think people realize.